Representation of the lunar gravity well, illustrating how resources needed only for the trip home don't have to be carried down and back up the "well"
Lunar orbit rendezvous was first known to be proposed in 1919 by Ukrainian Soviet engineer Yuri Kondratyuk, as the most economical way of sending a human on a round-trip journey to the Moon. The most famous example involved Apollo CSM and Apollo LM, where they were both sent to a Translunar flight in a single rocket stack. However, variants where the landers and main spacecraft travel separately, such as the lunar landing plan proposed for Shuttle-Derived Heavy Lift Launch Vehicle and Golden Spike, are also considered as Lunar Orbit rendezvous. The main advantage of LOR is the spacecraft payload saving, due to the fact that the propellant necessary to return from lunar orbit back to Earth need not be carried as dead weight down to the Moon and back into lunar orbit. This has a multiplicative effect, because each pound of "dead weight" propellant used later has to be propelled by more propellant sooner, and also because increased propellant requires increased tankage weight. The resultant weight increase would also require more thrust for lunar landing, which means larger and heavier engines. Another advantage is that the lunar lander can be designed for just that purpose, rather than requiring the main spacecraft to also be made suitable for a lunar landing. Finally, the second set of life support systems that the lunar lander requires can serve as a backup for the systems in the main spacecraft. When the Apollo Moon landing program was started in 1961, it was assumed that the three-man Command and Service Module combination (CSM) would be used for takeoff from the lunar surface, and return to Earth. It would therefore have to be landed on the Moon by a larger rocket stage with landing gear legs, resulting in a very large spacecraft (in excess of 100,000 pounds (45,000 kg)) to be sent to the Moon. If this were done by direct ascent (on a single launch vehicle), the rocket required would have to be extremely large, in the Nova class. The alternative to this would have been Earth orbit rendezvous, in which two or more rockets in the Saturn class would launch parts of the complete spacecraft, which would rendezvous in Earth orbit before departing for the Moon. This would possibly include a separately launched Earth departure stage, or require on-orbit refueling of the empty departure stage. 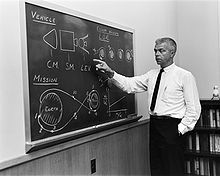 Tom Dolan proposed the alternative of lunar orbit rendezvous, which had been studied and promoted by Jim Chamberlin and Owen Maynard at the Space Task Group in 1960 early Apollo feasibility studies. This mode allowed a single Saturn V to launch the CSM to the Moon with a smaller Lunar Excursion Module (LEM). [Note 3] When the combined spacecraft reaches lunar orbit, one of the three astronauts remains with the CSM, while the other two enter the LEM, undock and descend to the surface of the Moon. They then use the ascent stage of the LEM to rejoin the CSM in lunar orbit, then discard the LEM and use the CSM for the return to Earth. This method was brought to the attention of NASA Associate Administrator Robert Seamans by Langley Research Center engineer John C. Houbolt, who led a team to develop it. Besides requiring less payload, the ability to use a lunar lander designed just for that purpose was another advantage of the LOR approach. 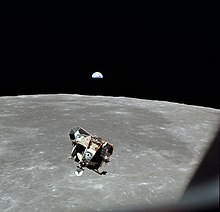 The LEM's design gave the astronauts a clear view of their landing site through observation windows approximately 15 feet (4.6 m) above the surface, as opposed to being on their backs in a Command Module lander, at least 40 or 50 feet (12 or 15 m) above the surface, able to see it only through a television screen. Developing the LEM as a second manned vehicle provided the further advantage of redundant critical systems (electrical power, life support, and propulsion), which enabled it to be used as a "lifeboat" to keep the astronauts alive and get them home safely in the event of a critical CSM system failure. This was envisioned as a contingency, but not made a part of the LEM specifications. As it turned out, this capability proved invaluable in 1970, when just such a critical failure occurred on the Apollo 13 mission when an oxygen tank failure disabled the Service Module. Dr. John Houbolt would not let the advantages of LOR be ignored. As a member of Lunar Mission Steering Group, Houbolt had been studying various technical aspects of space rendezvous since 1959 and was convinced, like several others at Langley Research Center, that LOR was not only the most feasible way to make it to the Moon before the decade was out, it was the only way. He had reported his findings to NASA on various occasions but felt strongly that the internal task forces (to which he made presentations) were following arbitrarily established "ground rules." According to Houbolt, these ground rules were constraining NASA's thinking about the lunar mission—and causing LOR to be ruled out before it was fairly considered. In November 1961, Houbolt took the bold step of skipping proper channels and writing a private letter, nine pages long, directly to Robert C. Seamans, the associate administrator. "Somewhat as a voice in the wilderness," Houbolt protested LOR's exclusion. "Do we want to go to the Moon or not?" the Langley engineer asked. "Why is Nova, with its ponderous size simply just accepted, and why is a much less grandiose scheme involving rendezvous ostracized or put on the defensive? I fully realize that contacting you in this manner is somewhat unorthodox," Houbolt admitted, "but the issues at stake are crucial enough to us all that an unusual course is warranted." It took two weeks for Seamans to reply to Houbolt's extraordinary letter. The associate administrator agreed that "it would be extremely harmful to our organization and to the country if our qualified staff were unduly limited by restrictive guidelines." He assured Houbolt that NASA would in the future be paying more attention to LOR than it had up to this time. The business of eyeballing that thing down to the Moon really didn't have a satisfactory answer. The best thing about LOR was that it allowed us to build a separate vehicle for landing. The first major group to break camp in favor of LOR was Robert Gilruth's Space Task Group, which was still located at Langley but was soon to move to Houston. The second to come over was the Von Braun team at the Marshall Space Flight Center in Huntsville, Alabama. Then these two powerful groups of converts, along with the original true believers at Langley, persuaded key officials at NASA Headquarters, notably Administrator James Webb, who had been holding out for direct ascent, that LOR was the only way to land on the Moon by 1969. With the key players inside NASA lined up behind the concept, Webb approved LOR in July 1962. The decision was officially announced at a press conference on July 11, 1962. President Kennedy's science adviser, Jerome Wiesner, remained firmly opposed to LOR. The proposed Soviet Lunar Landing plan, using the N1 rocket, LK Lander and Soyuz 7K-LOK would have used a similar LOR mission profile. The cancelled Constellation program Lunar Landing would have used a combination of Earth Orbit Rendezvous and Lunar Rendezvous. A robotic lunar orbit rendezvous is planned for use by the Chinese Chang'e 5 lunar sample return mission scheduled in 2019. Episode 5 of the television miniseries From the Earth to the Moon, "Spider", dramatizes John Houbolt's first attempt to convince NASA to adopt LOR for the Apollo Program in 1961, and traces the development of the LM up to its first manned test flight, Apollo 9, in 1969. The episode is named after the Apollo 9 LM. ^ Apollo 9 in Earth orbit; in lunar orbit on Apollo 10, Apollo 11, Apollo 12, Apollo 14, Apollo 15, Apollo 16, and Apollo 17. ^ This was shortened to "Lunar Module" (LM) in June 1966. ^ Harvey (2007), p. 6—7. ^ Wilford (1969), p. 41-48. ^ Gainor (2001), p. 62-66. ^ a b "The Rendezvous That Was Almost Missed: Lunar Orbit Rendezvous and the Apollo Program - NASA". www.nasa.gov. December 1992. Fact Sheet NF175. Retrieved 2017-03-20. ^ NASA (1962), p. 1. ^ Nelson (2009), p. 209—210. Bergin, Chris (2013-01-03). "Golden Spike contract Northrop Grumman for Lunar Lander". Nasaspaceflight.com. London. Archived from the original on 2013-01-04. Retrieved 2013-01-04. Brooks; Grimwood; Swenson (1979). "Chariots for Apollo: A History of Manned Lunar Spacecraft". NASA. Archived from the original on 2004-11-18. Retrieved 2007-04-27. Gainor, Chris (2001). Arrows to the Moon. Burlington, Ontario: Apogee Books. ISBN 978-1-896522-83-8. Hansen, James R. (1995). Enchanted Rendezvous: John C. Houbolt and the Genesis of the Lunar-Orbit Rendezvous Concept (PDF). Monographs in Aerospace History Series #4. Washington, D.C.: NASA. NASA-TM-111236. Harvey, Brian (2007). Russian Planetary Exploration: History, Development, Legacy and Prospects. New York: Springer. ISBN 978-0-387-46343-8. Laxman, Srinivas (2012-03-21). "China's Unmanned Moon Mission To Bring Back Lunar Soil To Earth". Singapore. Archived from the original on 2013-01-04. Retrieved 2013-01-04. Murray, Charles; Catherine Bly Cox (1989). Apollo: The Race to the Moon. New York: Simon and Schuster. ISBN 978-0-671-70625-8. NASA (1962). Lunar orbit rendezvous: news conference on Apollo plans at NASA headquarters on July 11, 1962. Washington, D.C.: NASA. Tennant, Diane (2009-11-15). "Forgotten engineer was key to space race success". HamptonRoads/PilotOnline. Archived from the original on 2010-11-18. Retrieved 2010-09-01. Witkin, Richard (1962-07-04). "Lunar Orbital Rendezvous: New Flight Plan to Moon Favored". The Globe and Mail. Toronto. New York Times Service. p. 1. Wilford, John (1969). We Reach the Moon; the New York Times Story of Man's Greatest Adventure. New York: Bantam Paperbacks. Woods, W. David (2008). How Apollo Flew to the Moon. New York: Springer. pp. 10–12. ISBN 978-0-387-71675-6.